When you bake a sweet potato, there is only one ingredient and very few minutes of prep. 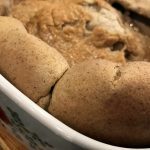 This recipe is excellent whether you need to bake one sweet potato, or a week’s worth for meal prep. If you look in our pantry, you might think we have a sweet potato addiction. And it’s probably true. At any given point in the week, you can find 10 pounds of fresh sweet potatoes in our pantry. Ever since starting to eat paleo, sweet potatoes quickly became our favorite veggie. We prepare sweet potatoes in many ways, but the one way we do the most is baking them. 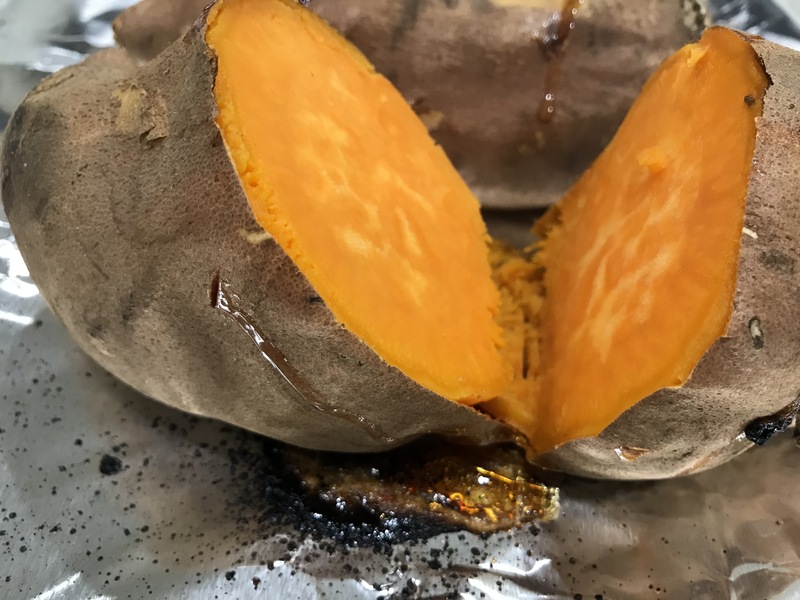 Baked sweet potatoes are great because they are quick to prep for the oven, and can be used in so many ways once cooked. Baking sweet potatoes is super simple and requires only one ingredient: sweet potatoes. Bake as little as one sweet potato or as many as your baking sheet can comfortably hold without them touching. Start by placing the oven rack in the middle and preheat your oven to 450°. Wash and dry the desired amount of medium/large sweet potatoes. Then pierce them several times with a knife or fork. 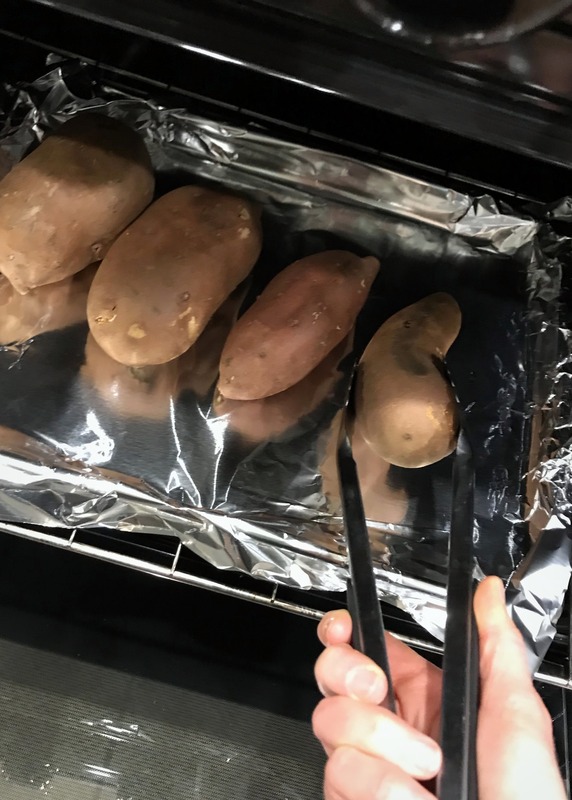 Place the sweet potatoes on an aluminum foil-lined baking sheet and bake for 30 minutes on the center rack. With tongs, flip the sweet potatoes and bake for another 30 minutes or until tender. Remove from oven and let cool for 5 to 10 minutes. Enjoy right away or store in an airtight container in the fridge for up to a week. 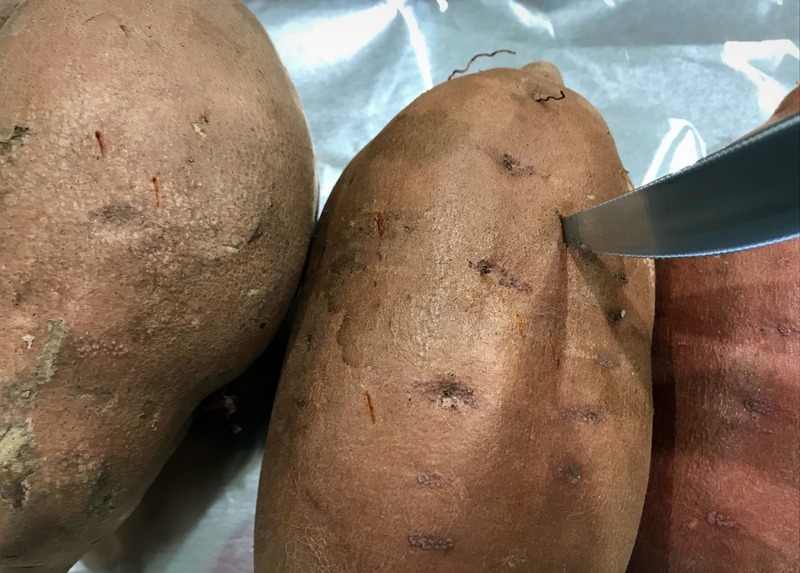 We usually cut our sweet potatoes in half before storing, and grab a half a sweet potato out of the fridge to pair with breakfast or lunch. 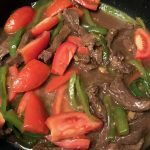 Makes for a super easy veggie side for any meal. You can eat it with the skin on, which is a great source of fiber, or you can effortlessly peel the skin off in one piece with your hands if the skin isn’t quite your thing. 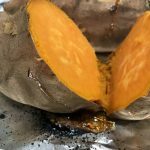 You can also peel off the skin and use the baked potato in other applications, like mashed sweet potatoes, sweet potato pancakes, sweet potato soup, or even just add a small dab of coconut oil and lightly sprinkle with cinnamon and salt and dig in. Looking for another sweet potato recipe? 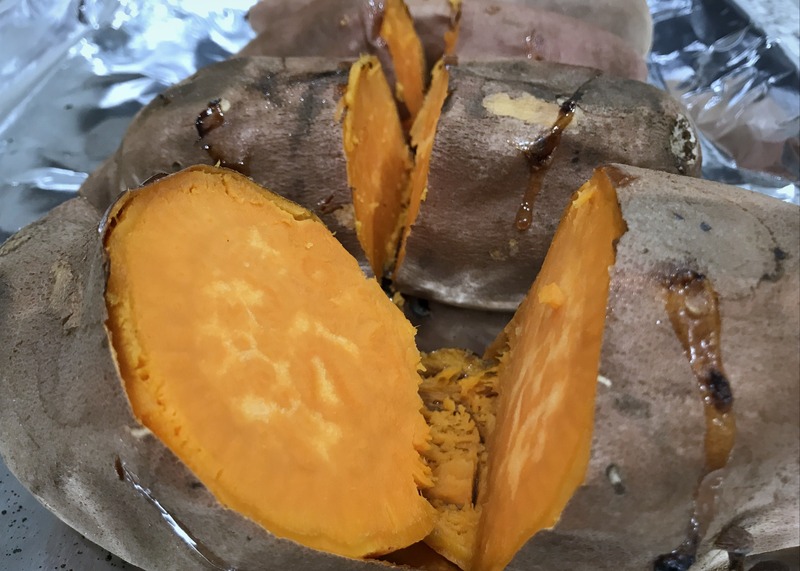 Check out my recipe for sweet potatoes roasted two ways. When you bake a sweet potato, there is only one ingredient and very few minutes of prep. 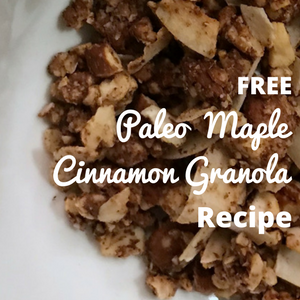 This recipe is excellent whether you need to bake one sweet potato or a week’s worth for meal prep. Place rack in the middle and heat oven to 450°. Wash and dry sweet potatoes. Then pierce them several times with a knife or fork. Simple and mouth watering. Thank you! I loooove sweet potatoes! I just don’t know how to bake them perfectly… thanks for sharing this recipe. Can’t wait to try it! Yum! I don’t know why I’ve never tried baking sweet potatoes. I definitely will now! Thanks for the post. We love sweet potatoes. 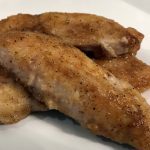 I rarely have time to cook them in the oven, so we normally stick them in the microwave covered in avocado oil, but this looks like a much healthier way to eat them! Can’t wait to try! We don’t have sweet potatoes very often, but I’m going to make them like this next time we do. Love this super-easy breakdown! Thanks so much!! !